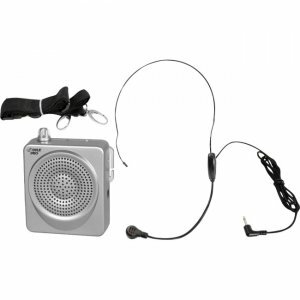 Always be heard with the PWMA50S, a 50-watt, rechargeable waist-band PA with headset Lavalier microphone. The small, super-powerful voice amplifier is perfect for teachers, coaches, tour guides, and presenters - you can be heard up to half a mile away. Built-in rechargeable batteries last up to 12 hours. Headset microphone keeps your hands free. The auxiliary input lets you play music from an iPod or other digital music player through the speaker. Belt clip, adjustable waist band strap, and carry bag included. Speaker color: silver.